Yeah, you heard me. After last years’ successful blogs (most notably the blog about ambition) I’ve decided to go for it. I’m 34 years old and should’ve had a book in print by now. Nope, it’s not bragging, ‘cos I know I got the gift, it’s just the graft I’ve always been lacking. But the blogs have helped. If I hadn’t written the blog about wanting to be in a zombie film last year then I would never have been an extra in the Zombie Diaries 2 (released July 2011), and the blogs also allowed me a further additional experience to my holiday in Canada as I looked at things in a completely different light with a view to blogging all about it. I think it also helped me enjoy the trip more in a way. So now the power of the blog shall help me again. By making this bold statement I’m putting additional pressure on myself. By telling all of you my plans it wouldn’t just be myself I would be letting down. I like to think that there are a few of you out there that would like to see me succeed in this, and would like to come along for the ride as I aim to get this bad boy published. 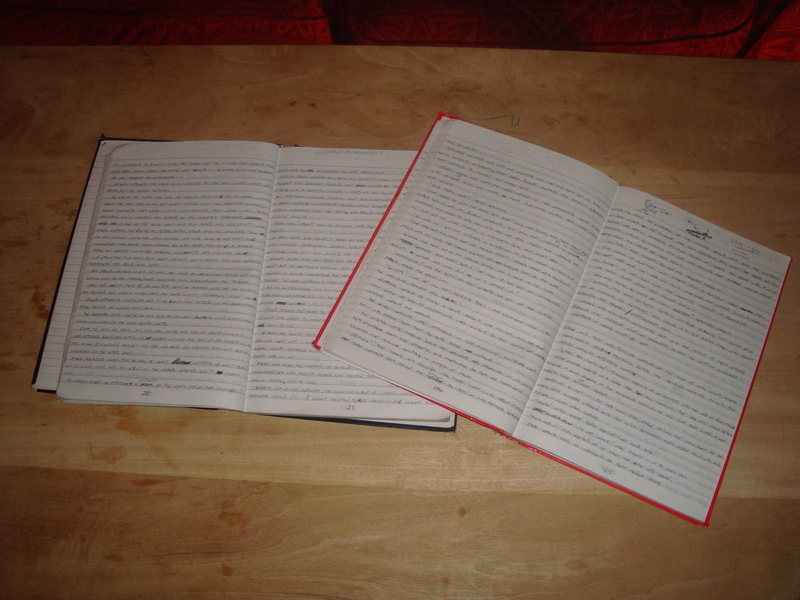 If you have read any of my previous articles then you will know that I have (at my feet beneath my computer table) two large notepads in which I have written 253 pages of badly-hand-written scrawl. And if you know me in any way at all, you’ll also realise that this is a book about my favourite subject: zombies. No wait, come back!! It’s good! (I think) I’ve written many, many things throughout my short life, but this book was something I always came back to and toyed with. It’s a living, breathing beast awaiting release… and that time is due. I’m also hoping that this blog and book will help any other wannabe writers out there, to guide then on which steps to take (or not to take!). Although I have never had a book published I know a lot more than the average layman does of the process. It’s something I’ve studied for years as I knew one day that I would need this knowledge. Now I’m going to put that knowledge to the test. Even if you have no desire to be a published author then hopefully the blog will still be as enjoyable to you as most of my others, and feel free to stop me in the street (or email, or Tweet) and ask me how things are going and to make sure I’m not slacking off either! I’ll leave it at that for now, as I have declared January to be a month of detox from my many vices while I concentrate on getting The Book finished and published. Monthly updates shall entail, but feel free to comment below and ask me any questions you may have. Let’s get this undead baby out into the world. cool, always pictured you writing comics but then again my view is of mr ruth sans 18 years ago. I am deffo coming along for this ride!! I was really pleased for ya when the extra in the zombie flick happened … I’ll be stoked when this happens too! !